Below you can find rules for all our games, as well as Frequently Asked Questions in our Troubleshooting Section. Our troubleshooting section is broken down into categories, containing frequently asked questions. Click on the category name to see all questions. Frequently Asked Questions about Points for Prizes®, Points For Drawings™, Subscriptions and much, much more! Questions about or problems with registering for the club. To join, ((you must be 18 years of age or older and a US citizen) click the [Sign Up] button on the left hand side of the page. You will then be directed to a registration page to complete. Why am I getting the error "You have been locked out for attempting to register unsuccessfully too many times" when trying to register for my Players Club account? Your name, address and the last four digits of your Social Security number are used to verify your identity. Please call the Player Services hotline toll-free at 1&dash;800&dash;201-0108 and explain to them that your account has been locked for age/ID-verification. No. Only one individual account is allowed per Player. Players can however, be part of multiple groups/pools. Why won't the form accept an entry &dash; such as phone number, email address or password &dash; even though the information is correct? Certain fields have specific formatting requirements. So even if you enter the correct information, if it is not formatted properly, it will not be accepted. Phone Number: You must follow the format listed on the page, which is NNN-NNN-NNNN. If you try to enter the number in any other format, such as (NNN) NNN&dash;NNNN or NNN.NNN.NNNN, it will not be accepted. Email: You must enter a valid email address. If the "Email" field and the "Confirm Email" field don't match, you will receive an error. Password: Passwords must be at least 5 characters long and cannot contain any spaces. As with the email field, if the "Password" and "Confirm Password" fields don't match, you will receive an error. I never received the email to finalize my registration. I've requested it several times but it has never arrived. The first step is to check to see if the email is in your Junk or Spam folder. Then be sure that you have added "do_not_reply@lottery.nd.gov" to your address book to ensure you will receive future emails. If there is no email in your Junk or Spam folder, and after you have added our email to your address book, follow the "forgot password" process to have another email sent to you. If you still do not receive the email, it is possible your email provider or ISP (Internet Service Provider) is employing spam filters that are inadvertently preventing you from getting our emails. Spam filters employed by ISPs are extremely indiscriminate and far from fool-proof. As a result, legitimate email often gets tagged as "spam." Below is a list of popular ISPs that employ filters that often produce false results. If you feel your emails are being inadvertently blocked at the ISP level, please contact your ISP for assistance. Why can't two people use the same email address to register? Email address is used for your login credentials, which means each member must have a unique email address in our system. Problems logging in to the club. I have been locked out of my account. What do I do? If your account is locked, please contact Player Support at (701) 328-1574 or Toll Free at 1-877-635-6886 between 8AM and 5PM CT Monday through Friday. On weekends and after hours call 1-800-201-0108 to be unlocked. To retrieve your password, click the Log In link on the Home page and then click the Forgot Your Password link. An email will be sent to the registered email address with a link to reset the password. You may also contact Player Support at (701) 328-1574 or Toll Free at 1-877-635-6886 between 8AM and 5PM CT Monday through Friday. On weekends and after hours call 1-800-201-0108 to be unlocked. When I try to reset my password, it won't accept my entry. Be sure the new password is at least 5 characters long and doesn't contain any spaces. In addition, the "Password" and "Confirm Password" fields must match. I never received the email to reset my password. I've requested it several times but it has never arrived. The first step is to check to see if the email is in your Junk or Spam folder. Then be sure that you have added "do_not_reply@lottery.nd.gov" to your address book to ensure you receive future emails. If there is no email in your Junk or Spam folder, and after you have added our email to your address book, follow the "forgot password" process to have another email sent to you. How to update account information for the club. To change your contact information (once signed in), click the My Account link (from the header) or My Account → My Profile → My Info in the left navigation panel. This will allow you to change your contact information. To change your password (once signed in), click the My Account tab (from the header). This will allow you to change your personal information. I closed my account; can I re-open it? If you have closed your account and wish to start playing again, we may be able to assist you. Please contact our Player Support at (701) 328-1574 or Toll Free at 1-877-635-6886 between 8AM and 5PM CT Monday through Friday. Information related to general problems accessing the system. Computer issues of all types can be very frustrating. Please be assured that we work very hard on our software to create the best, most trouble-free experience for you that we can. However, problems may stem from your computer or your Internet connection, both of which are beyond our control. Your computer specifications, the number of programs that you are running, presence of spyware or adware, problems with Flash or the speed of your internet connection can all contribute to technical difficulties. Many of these technical issues have the potential to disrupt your play. They may result in reels continually spinning or games freezing at inopportune times. We know this is aggravating, but it is the nature of Internet-based games. Below are some common technical issues that we can try to help you troubleshoot. When I try to load the game system it hangs on the loading screen. What's wrong? There are a number of possible causes for the game system hanging on the loading screen. Below are some troubleshooting tips. Cache Needs To Be Cleared. There could be a conflict with your cached version of the game system and any new version we may have released. Clear your cache and then try logging in again. To clear your cache, find your browser below and follow the instructions. Make sure to uncheck anything you would like to preserve except "Temporary Internet Files" and "Cookies" then click Delete. Both Firefox and Chrome change their procedures often, you can find information about each by clicking the link below. While we don't officially support AOL browsers, you can find information about clearing your AOL cache here. In addition, our site requires active scripting and cookies be enabled; you can find information on how to do that here. Web accelerators and optimizers, like NetZero HiSpeed or AOL TopSpeed, use a combination of caching and compression technologies to speed the delivery of webpage content. The caching of files can also interfere with the loading of our game system. If you are experiencing loading problems, try disabling this service. Our game system works on most browsers and platforms, however, the only officially supported browsers are Internet Explorer and Firefox. Players using dial-up service with a slow connection may have to wait several minutes for the game system to fully load. I lost my Internet connection while in a game; what do I do? Simply log back in and continue. Please note, however, that if you have technical issues that disrupt and end your game (your browser crashes or you lose your Internet connection) the credit you were using will be considered used. However, any reward that has been revealed will not be lost even though the game was not completed. Why won't the reels stop spinning in the spinning reel games? The likely cause of this is that there was a minor, temporary disruption of the Internet communication required to keep the game operating properly. When you encounter this problem, close your browser then reopen it and log back in to play. Please note that satellite connections are particularly prone to this issue. What are the system requirements to play the games? Questions about the Fun Play product. Fun Play is a suite of online games that you can play anytime you want, as much as you want, just for fun. You can brush up on a game you haven't played for a while, or learn a new game entirely. The chips are to help you keep track of your progress and to climb the leader boards. If your chip balance starts to run low, the game system will display a message offering you more. Since Fun Play is just for fun and the chips have no intrinstic value, you never have to worry about running out. Why don't all the games offered have a leader board? Leader boards are only included for games that require players to formulate a strategy for the game. Does it matter what computer I use? Choose a game from the list below to read the game rules. Please note that not all games listed here are offered at all times. The goal of craps is to successfully predict the outcome of the roll of two dice. While there are many types of bets that can be made, with varying payouts, the most common bets are the Pass Line and Don't Pass bets. Craps is played with two dice in a series of rounds; each new round begins with the roll of the dice, called the "come-out roll." The person rolling the dice is known as the "shooter." Depending on what is rolled, the game play progresses as described below. If the come-out roll is a 7 or 11, also known as a "natural," the round ends here and bets are won or lost. If the come-out roll is a 2, 3 or 12, also known as "craps," again the round ends here and bets are won or lost. If the come-out roll is a 4, 5, 6, 8, 9 or 10, that number becomes the "point" and the round continues. The round will end only when the shooter rolls the point again, or a 7, known as "7 out." Before you can roll the dice you must place a bet on the table. The types of bets available in craps are described below. A pass line bet wins if the come-out roll is a 7 or 11 (a natural) and loses if it is 2, 3 or 12 (craps). If the come-out roll is any other number, that number becomes point and is marked on the table with the "on" puck. "On" puck marking point as 8. If the shooter rolls point again before rolling a 7, the pass line bet wins. If, however, the shooter rolls a 7 before rolling the point, the pass line bet loses. To place this bet, click on the "Pass Line." Once point has been established you cannot reduce the amount or remove the bet, nor can you place a new bet. The payout for this bet is 1:1. This is the inverse of the Pass Line bet. This bet wins if the come-out roll is 2 or 3 (craps) and loses if it is a 7 or 11 (natural). A 12 is a push and the bet is returned. If any other number is rolled, that becomes the point and is marked on the table with the "on" puck. If the shooter rolls a 7 before rolling the point again, the Don't Pass bet wins. If the shooter rolls the point before a 7, the Don't Pass bet loses. To place this bet, click on the "Don't Pass Bar." Once point has been established, this bet can be reduced or even removed, but cannot be placed or increased. The payout for this bet is 1:1. The Come bet has the same rules as the Pass Line bet, with the exception that it can only be made after point has been set. In other words, you can't make this bet on the come-out roll. After you place the Come bet, you win if the next dice roll is a 7 or 11, and lose if it is 2, 3 or 12. If any other number is rolled, that becomes the Come Point, and you will only win if the come point is rolled again before a 7. If a 7 is rolled before the come point, you lose. If a come point is established, your bet will be moved to the row of numbers at the top of the screen and placed on the come point number. Come bet, with come point set to 5. To place this bet, click on the "Come Bar." Once the come point has been established, this bet cannot be reduced or removed. The payout is 1:1. The Don't Come bet is the inverse of the Come bet, and it can only be made after point has been established. After you place the Don't Come bet, you win if the next dice roll is a 2 or 3 (12 is a push and your bet is returned). You lose if the roll is a 7 or 11. If any other number is rolled it becomes the Come point. You win if 7 is rolled before the come point, and lose if the come point is rolled before 7. If a come point is established, your bet will be moved to the area directly above the row of numbers at the top of the screen and placed above the come point. Don't Come bet, with come point set to 10. To place this bet, click on the "Don't Come Bar." This bet can be reduced or removed at any time, even after the come point has been established. The payout is 1:1. After point is established, if you have a Pass Line, Don't Pass, Come or Don't Come bet, you can make an additional bet with an Odds bet. This is a popular bet because it pays "true odds." That is, the odds are based on comparing the chance of your number being rolled before the 7. 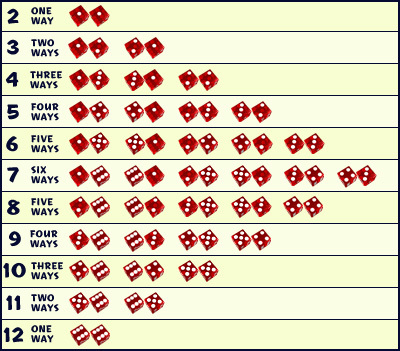 The image below shows the breakdown of the chances of rolling each number, based on the total possible combinations. Seven has six different combinations and therefore has the highest chance of being rolled. To place the Pass Line Odds bet, click in the area directly below your original bet. Your Odds bet can only be 3x your initial bet. These bets can be placed, increased, decreased or removed at any time after point has been established. To place the Come Odds bet, click to the right of your Come bet. Your Odds bet can only be 3x your initial bet. These bets can be placed, increased, decreased or removed at any time after the come point has been established. To place the Don't Pass Odds bet, click to the right of your Don't Pass Line bet. Your Odds bet can only be 3x your initial bet. To place the Don't Come Odds bet, click to the right of your Don't Come bet. Your Odds bet can only be 3x your initial bet. A Place bet is a bet on a specific number. You can make this bet at any time, but it will be "off" or inactive during the come-out roll. You can bet on 4, 5, 6, 8, 9 or 10, and you win if your number is rolled before a 7. To make this bet, click on the area directly below the row of numbers at the top of the table. You can remove this bet at anytime. Place bets stay up after winning and must be removed manually to be taken down. NOTE: Existing Place bets are off, or inactive, during a come-out roll. The payout varies based on the number chosen. If you click the "Place Across" button, your bet will be placed on every number except the number that is point. The bet will be made with the current denomination selected. A Buy bet is similar to a Place bet in that you're betting on a specific number: 4, 5, 6, 8, 9 or 10. If your number is rolled before 7, you win. Where the buy bet differs is that it pays out true odds and has a Vigorish, or "vig," of 5% of your bet (which is taken from the winnings). To make this bet, click on the lower half of the number you want, in the row of numbers at the top of the table. You can make this bet at any time, including at the come-out roll. You can also remove this bet at any time. NOTE: Existing Buy bets are off, or inactive, during the come-out roll. Lay bets are the inverse of the Buy bet. You're betting that 7 will be rolled before a specific number. You can bet on 4, 5, 6, 8, 9 or 10. If 7 is rolled before your number, you win. If your number is rolled before 7, you lose. This bet also pays out true odds and has a vig of 5% of your winnings. To make this bet, click on the area directly above the row of numbers at the top of the table, above the number of your choice. You can make this bet at any time, including at the come-out roll. Unlike a Buy bet, you cannot remove this bet once it's been made. NOTE: Existing Lay bets are on, or active, during the come-out roll. This is a bet that a 6 or an 8 will be rolled before a 7. It can be made at any time, including the come-out roll. It can also be removed at any time. To make this bet, click on the section of the table marked "Big 6" or "Big 8." The payout is 1:1. The Field bet is a bet on one dice roll only. You're not betting on a specific number but on a field of numbers: 2, 3, 4, 9, 10, 11 and 12. To make this bet, simple click on the section of the table marked "Field." Field bets pay 1:1, with the exception of 2 and 12, which pay 2:1. The one roll bets can be made at any time, including before the come-out roll. As the name suggests, these are for one roll only. The Hardway bets cannot be placed before the come-out roll, and they last for more than just a single roll. Hardway bets win if the number is rolled the "hardway" (that is 2-2 for a 4; 3-3 for a 6, 4-4 for an 8 and 5-5 for a 10) before a 7 is rolled, or the soft number is rolled (i.e. 4-2 for a 6, or 6-4 for a 10). To begin playing, choose your credit value by clicking on a chip in the control panel. When a credit value is selected, the chip is raised up to indicate it is active. The system will keep that value selected until you choose a different credit value. Make your bet by clicking on the desired bet area on the table. The chip will appear on the table. If you click a second time, a second chip will appear, and so on. To remove a bet, hold the SHIFT key and click on the chip on the table. Or, click the "UNDO" button in the control panel. Once your bet or bets are placed, start the game by clicking the ROLL DICE button. The outcome will simply be displayed. You can see a close up of the dice results in the upper left of the game screen. In addition, the result will be printed in the message area on the control panel. If you win, the appropriate number of chips will be added to your bet and then the chips will slide to the lower portion of the table and be added to your bank. The message area will display the results of the bet. If you lose, your chips will be moved toward the dealer's chips. All game outcomes remain on the table in full view for your examination until you click ROLL DICE or place a new bet. When you play Star-Studded Solitaire, the game automatically uses a single chip with the value of 1. Your goal is to move all cards to the four foundation stacks, building from ace to king in ascending rank by suit. The game begins with seven stacks dealt to the tableau. You can move cards around on the tableau only by placing one card on top of another card that is one lower in rank and an opposite color. For example, you could place a black five on top of a red six. You can flip cards from the stockpile three at a time. Only the top card on the stockpile is available for play, either to the tableau or to the foundation stacks. When you've gone through the entire stockpile, simply click the circle to the left of the cards to start the deck over. Only kings can be placed in open spots on the tableau. In addition to the standard rules of solitaire, this game has a special twist! All cards of the Diamond suit are considered Prize Cards. They appear with a glow and highlight to indicate their special status. Clicking on a Prize Card will cause one of the 13 reels above the cards to spin. Gold dollar signs reveal your winnings on the pay table to the right of the cards. You can click on a Prize Card any time you can see its face, even if it's under other cards. It is possible that you would come to a stalemate in your solitaire game without having clicked on all the Prize Cards. In that event you'll see a message stating that you have no more moves, and the remaining reels will automatically spin to reveal your winnings. When you play Slingo® Jackpot, the game automatically uses a single chip with the value of 1. The object of the game is to earn enough points to reach the Prize Zone and while there create Slingos — five daubed squares across, down or vertical. To begin, click the "START GAME" button to receive the numbers on your card. The game card consists of 25 squares arranged in a 5 x 5 grid. The game begins with 12 spins. Click the "TAKE SPIN" button to spin the reels. The reels will stop to display a game icon or a number. If the number in a reel also appears in the column above the reel, you can click on the number to daub it. Each daubed square earns 200 points. If you receive a Joker, you can daub any square in that column. If you receive a green Super Joker you can daub any number on the card, in any column. You must place the Super Joker before you match other numbers or Jokers. If you land three or more Jokers in a spin, you'll earn bonus points. A Gold Coin earns 1,000 points. Slingos — five daubed squares across, down or vertical — earns 1,000 points. If you land a FREE SPIN on a reel, one spin will be added to your SPINS display. If you land the Devil on a reel, he will take half your points. The Cherub may appear and chase away the Devil before he can take your points. When you've earned 7,500 points, you enter the Prize Zone. While in the Prize Zone, any Slingos you make — five daubed squares across, down or vertical — will reveal your winnings. Texas Hold 'Em Poker is a multiplayer game where each player receives two hole cards, face down, plus five community cards that are shared among all players. The community cards are dealt in rounds with the opportunity to bet or raise. The player who can make the best 5-card poker hand from the seven available cards wins the pot. This version of Texas Hold 'Em features computer players. One 52-card deck is used, and re-shuffled between each hand. In the case of a tie, the players split the pot evenly. During the first two rounds of betting, the low stake is used; during the last two rounds of betting, the high stake is used. The amount of the stakes increases every time the dealer button has made a full orbit of the table. The Small and Big Blinds are posted automatically. The big blind is equal to the low stake, and the small blind is half of that amount. High Card If a hand doesn't contain any of the above combinations, it is valued by the highest card in it. Each Texas Hold 'Em Poker game has a buy-in amount. You bring this amount of credits to the table with you, and can continue playing as long as you have credits. The game will continue until there is only one player left who has won all the credits. There is no ante. Instead, there is a small and big blind that must be made. These are made by the two players to the left of the dealer. The player to the immediate left of the dealer must post the small blind, and the player to the left of the small blind bettor must post the big blind. The player who is dealer rotates clockwise around the table after each hand so everyone at some point must post a blind. Once the blinds are posted, two cards are dealt face down to each player. These are called the Hole cards. The first of four rounds of betting now occurs. Starting with the player to left of the big blind bettor, the player has three choices: He can call the big blind, he can fold, or he can raise. Play moves clockwise around the table. After the initial round of betting, the first three community cards, called The Flop, are dealt face up in the center of the table. There will be five community cards total dealt, and they are shared by all players. After the flop, a second round of betting occurs, this time beginning with the first active player to the left of the dealer. He can fold, check  which puts no money down  or raise. If the player decides to raise, then each successive player must decide to either fold, call or add their own raise. The fourth community card, called the Turn, is dealt face up to the center of the table. This is followed by the third round of betting, again starting with the first active player to the dealer's left and moving clockwise around the table. The fifth and final community card, called the River, is dealt. This is followed by the fourth and final rounding of betting. Once the betting is complete, it is time for the showdown. The first active player to the left of the dealer must flip over his two hole cards. The best 5-card poker hand possible is made using the community cards and his hole cards. Moving clockwise around the table, each active player then has the choice to flip over his hole cards to make a claim on the pot, or decide to "muck it" and not show their cards, forfeiting a claim on the pot. The player with the highest poker hand wins the pot. In the case where the players use only the five community cards to form the strongest hand, the game is a tie and all such players evenly split the pot. If you win, the chips from the pot will be added to your bank. The message area will display the results of the bet. All game outcomes remain on the table in full view for your examination until you click the "NEXT HAND" button.